The last couple of days I’ve been trying to absorb the impact of Saturday’s turnout for Kenny’s 6th anniversary vigil. I’ve contemplated on what to say and how to write it but I haven’t been able to express my feelings the way I would like in writing. When I spoke to Kenny Jr. about holding another vigil, he agreed, but I could see in his face he didn’t really want to. However, I made the decision to have it based on the simple fact that justice has yet to be served. I also know that when Kenny is old enough to fully understand why the fight is so important he will stand in his shoes as the son of Kenny Lazo PROUDLY rather than with his head DOWN. As the JfKC crew started to plan this year’s event, I decided to hold fundraisers out here in Long Island and in New York City to help bring city folks out here and pay for the vigil materials. The fundraisers were a success – we were able to raise a large portion of the funds we needed and the response from the participants was profound. As time got closer, I felt myself falling into a deep depression. I cried. I spent hours looking at everything we’d done since 2008. My heart was hurting. My son cried for the 1st time in years. I questioned if what I was doing was the right way to be going about it. We reserved the bus for city folks. As the days went on, I began receiving confirmation emails for bus seat reservations. With every reservation, I became stronger and stronger. Every reservation became a part of the strength I needed to move forward with this year’s vigil. On the day of the vigil, April 12th, I felt conflicted and full of emotions, as I tried to stay focused without breaking down. I arrived to the Suffolk County Police Department, 3rd Precinct, and started pulling out all the posters, signs and candles. As I was reading each poster, I felt myself wearing down again but remained strong for my children. Within no time I looked around and saw myself surrounded by at least 70 folks chanting, holding signs, handing out flyers, and building with one another, all for Kenny and the other victims. The energy was so powerful. This was one of the largest turnouts we have had and very heartfelt. Some of you may question why I barely chanted and spoke out. The only answer I have is that it’s a way I control my emotions. Seeing each and every one of you, some new faces and some old (who have come out year after year), really does provide the backbone we need to continue this struggle. Having the presence of such strong and vocal folks who know my pain and are able to express it is simply breathtaking. Once again, I want to thank you all for simply being there and being a part of Justice for Kenny. I truly hope that you all continue to share his story along with all other victims’ stories. I truly believe if we keep standing up and sharing our voices, change will happen! As the Cop Watch shirts says, “THE STREETS ARE WATCHING.” The police will not be able to abuse their power when the masses are watching their moves. My faith is where it needs to be and my strength comes from all of you! I WILL NOT STOP!!! THANK YOU ALL ONCE AGAIN FROM DEEP WITHIN MY HEART! 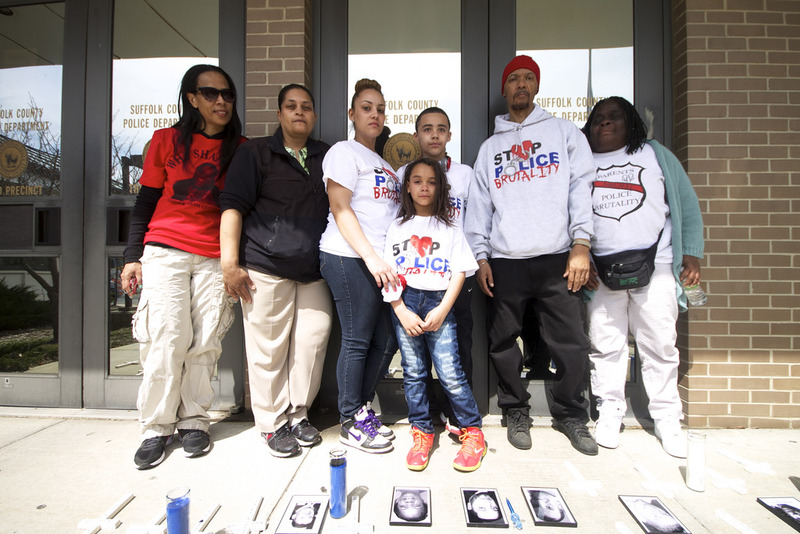 Jennifer Gonzalez, partner of Kenny Lazo, mother of Kenny Jr.
Family members of Stolen Lives (killed by Law Enforcement) gathered together on April 12th, 2014, for the Annual Anti-Police Brutality March in Long Island/6th Anniversary of Kenny Lazo’s police murder, in front of the Suffolk County Police Department, 3rd Precinct. From left to right, Ang Hicks, aunt of Shantel Davis, Cynthia Howell, niece of Alberta Spruill, Jennifer Gonzalez, partner of Kenny Lazo, Kenny Lazo, son of Kenny Lazo, (in front) Elliana Tavarese, sister of Kenny Jr./daughter of Jennifer Gonzalez, Nicholas Heyward, father of Nicholas Heyward Jr., Juanita Young, mother of Malcolm Ferguson.